CEO EXITS PLUNGE 34% IN FEBRUARY TO 87 | Page 3 | Challenger, Gray & Christmas, Inc. 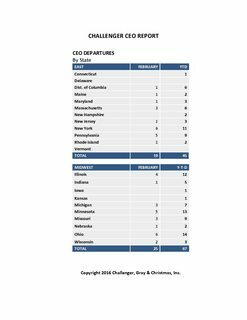 Turnover among the nation’s chief executive officers plunged 34 percent in February, as 87 CEO departures were announced, down from 131 in January, according to a report released Wednesday by global outplacement consultancy Challenger, Gray & Christmas, Inc. The February total was 7.4 percent lower than the same month a year ago, when announced CEO departures totaled 94. 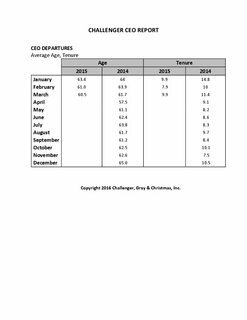 Despite the fall in February departures, CEO turnover for the year is up slightly over last year’s levels. 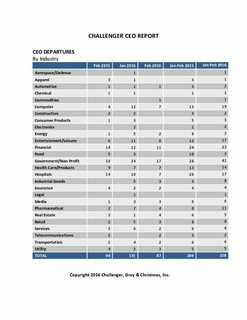 To date, 218 CEO changes have been recorded, up 7.0 percent from the 204 announced during the first two months of 2015. 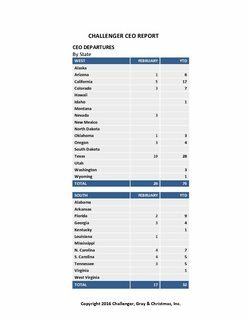 Government agencies and non-profits experienced the highest number of CEO departures during the month, with 17 announced exits. 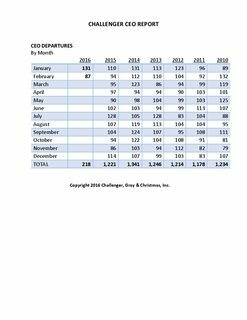 Through the first two months of the year, organizations in this sector have seen 41 CEO changes, compared to 28 at this juncture a year ago. 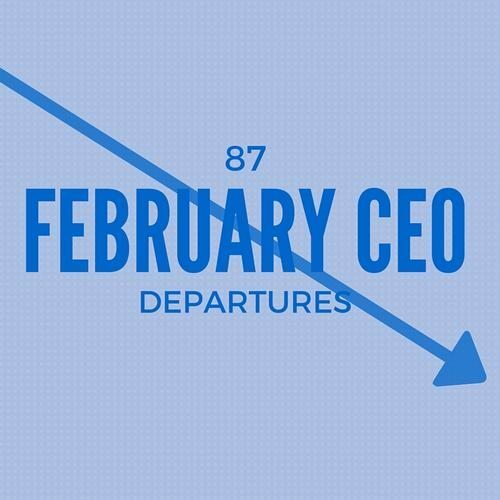 Financial firms, which announced 11 CEO changes in February, rank second in departures for the year with 23 total exits. In February, 33 chief executives announced their retirements. Among them was Richard Anderson, who served nearly 10 years as the CEO of Delta Airlines. 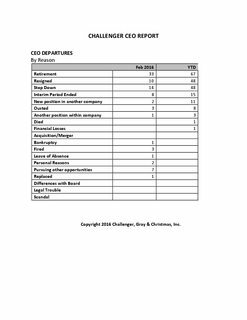 Retirement has been cited by 67 CEOs this year, making it the most common reason for departure. Forty-eight CEOs have resigned this year and another 48 have “stepped down,” which typically implies that the executive remains with the company or organization in some capacity. Among the 10 resignations recorded in February, was the controversial co-founder and CEO of the HR software provider Zenefits, Parker Conrad. In an email to employees, the company’s new CEO David Sacks explained that Conrad resigned due to “inadequate compliance measures” related to selling benefits, such as insurance, without the proper licenses. Conrad was already under increasing scrutiny for creating a frat-house like culture where alcohol flowed freely and stairwells were commonly used for co-worker hook-ups. Two CEOs cited “personal reasons” for their February departures, including former Victoria’s Secret executive Sharen Jester Turney. Turney left the women’s clothing retailer after 10 years, stating the need to prioritize her family and personal life.